Real Worlds’ Maximizer Plus Feed Concentrate was developed by our team of professional nutritionists working in cooperation with whitetail veterinarian Dr. Clifford Shipley from the University of Illinois. The goal was to develop a concentrated feed additive for captive deer farmers that would contain all of the minerals, vitamins and micro-nutrients that a whitetail needs to thrive and maximize antler growth and fawn production. This product also contains Real World’s exclusive Expect Healthy Deer Technology® which helps to keep the deer herd healthy and productive. While Maximizer Plus Feed Concentrate was developed for captive deer farmers, it is also a great product to use when supplemental feeding wild deer. 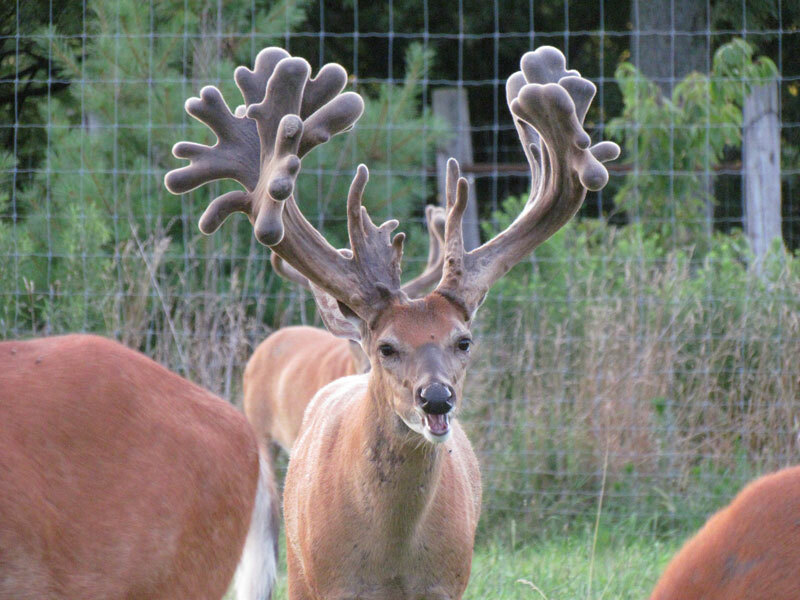 Think about it, captive deer farmers are paid by the inch when they sell their bucks; thus they do whatever it takes to maximize antler growth. If Real Worlds Maximizer Plus Feed Concentrate is good enough for them, wouldn’t it be good enough for maximizing antler growth in wild bucks as well? When you use Maximizer Plus Feed Concentrate you do not have to add other minerals or vitamin products to your feed although we do strongly encourage you to have mineral licks charged with Real Worlds Maximizer or Maximizer Plus minerals on your property. Simply mix this concentrate with grains at a rate of 200 lbs per ton of complete feed or 10% of the total feed ration. Below is an example feed formula for creating a well-balanced feed ration for whitetails. We encourage you to work with your feed mill or nutritionist when developing diets using Maximizer Plus Concentrate. This feed recipe aims to provide a well-balanced feed ration that is approximately 17% protein, 8% fat, 8% crude fiber and contains all of the minerals, vitamins and nutrients that whitetails need to produce healthy productive fawns and antlers to the genetic potential of the individual bucks consuming it. This feed also contains Real World’s Expect Healthy Deer Technology® to help keep deer alive and healthy. These grains and feed ingredients can be purchased locally at any feed mill. These mills can also custom mix your feed and even bag it for you. Real World recommends that feed be offered to wild deer using specially designed feeders rather than a broadcast feeder or piled onto the ground to prevent wasted or ruined feed. Moisture such as rain or dew can cause feed to mold in a short period of time.